There were some high scores in last week's newsquiz. Ted Ditchburn, Alex Richman and Ben Jackson all scored 17.5, narrowly beating Alex Murphy on 17 and John Penman on 16.5. Adam Batstone and Lucy Thorpe were the top team with 18. Here's this week's quiz ... posted a little later as I was on an overnight flight back from New York. As usual, there are 25 points up for grabs, let me know how you get on. And if you really fancy a challenge, have a crack at the American newsquiz which can be found here. 1. French newspaper Le Monde accused Theresa May of trying to exploit divisions between which two people? 2. Angela Eagle cancelled her constituency surgeries following threats and a brick being thrown through her office window. What is her constituency? 3. 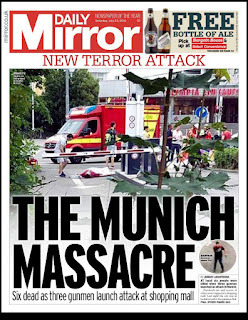 The gunman who killed nine people in Munich began his murder spree by shooting at diners outside which restaurant? Bonus: How many people were injured when an Afghan refugee attacked passengers on a train in Germany? Bonus: How many people have been charged with terror offences relating to helping Mohamed Lahouaiej-Bouhlel prepare the Nice terror attack? 4. An off-duty serviceman fought off an attempted kidnap attempt outside which RAF base? 5. Introducing her father at the Republican National Convention, Ivanka Trump said: ‘He is colorblind and ______ _________’. What are the missing two words? Bonus: Donald Trump upset members of an old English rock band by finishing his speech with one of their songs. Name the band and the song. 6. Fans walked out of a festival in Brentwood after Bob Geldoff swore on stage and said they were all wearing which brand of clothes? 7. Why did boys at Longhill High School, Brighton, wear skirts for school? 8. Who looks destined to become Lady Glenn Affric? 9. What word did Taylor Swift say she had not heard during a conversation with Kanye West? Bonus: What is the name of the song at the centre of the row between Swift and West? Bonus: Who said: 'Taylor and I have always believed we are soulmates.’? 10. How old were the two females who were sentenced to be detained for three years and three months after being found guilty of kidnapping a toddler in Primark, Newcastle? 11. Russian track and field athletes failed to overturn a ban from the Olympics. What date do the Olympics start? 12. Who took over as chairman and acting chief executive of Fox News in America? 13. Michelle Obama sang with James Corden for Carpool Karaoke. Who joined them? 14. Four photographs have been released to celebrate Prince George’s third birthday. One is of him offering ice cream to the family’s dog. What is its name? 15. Who is to replace new England manager Sam Allardyce at his old club, Sunderland? 16. Turkey's President Recep Tayyip Erdogan accused which US-based cleric of being behind the failed coup? 17. Why was a man, who would only give his names as Franck, hailed as a hero? 18. Liz Truss became the first female in 800 years to hold which position? 19. In which English market town did a man shoot dead his wife and teenage daughter before killing himself? 20. What did Maurice Hunter forget to take on holiday with him to Spain?